The Rav who was from Kuvno, Lithuuania was a descendant of the Vilna Gaon’s sister. Location: Section: Shomrei Shabos Cemetery of Congregation Agudath Acim, located on C Street, back right. His brother Reb Pesach was a “Moreh Horah” in Vilna. He authored seforim on the subject of the mesorah in sifrey torah: http://www.hebrewbooks.org/6251. 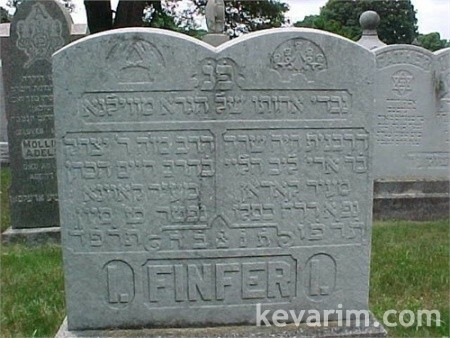 Reb Pesach’s son-in-law was Reb Moshe Karelitz a younger brother of the Chazon Ish (he was killed by the Nazis yma”sh). Reb Moshe was the editor of the Torah journal “Knesses Yisroel” which appeared in Vilna in the ’30s. He also printed “Shareey Tshuvah” with his comments: http://www.hebrewbooks.org/38229. See here a bit a bout his family: http://www.otzar.org/forums/viewtopic.php?f=19&t=3073&p=23068#p22711.